Correct Your Bumpsteer with a UPR Pro-Series Bumpsteer Kit. Equipped with the very best Teflon lined spherical rod ends mounted in 7075 Billet Aluminum Bumpsteer Knuckle then transferring the demand to 4140 tapered studs to be able to handle whatever you throw at it. Featuring high strength chrome moly 4140 no drill tapered shafts for an easy installation into the spindles. Recommended for all Mopar LX's & LC's for easier alignments and the widest range of adjustments. 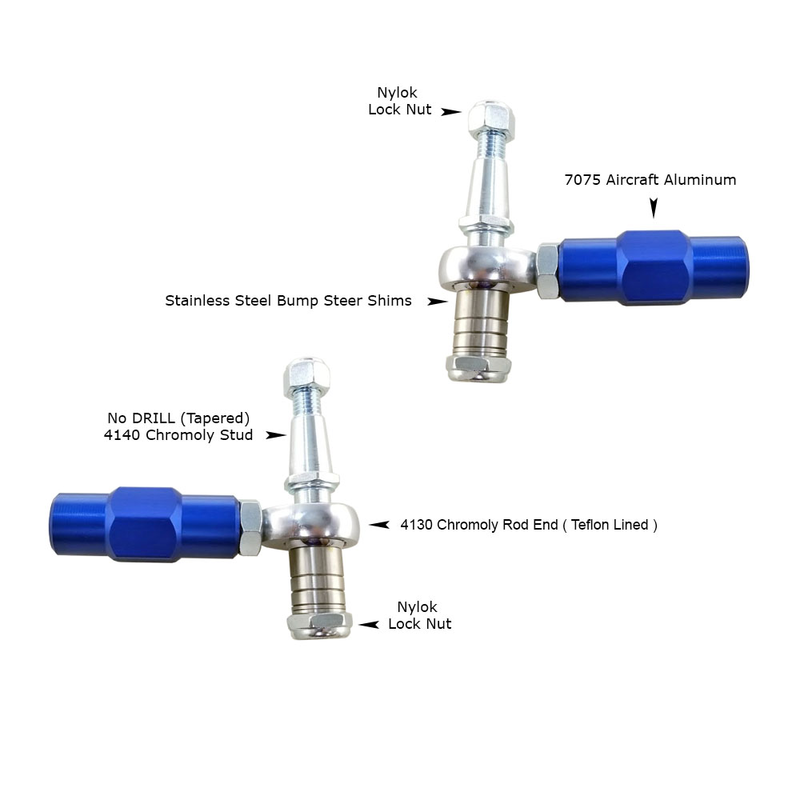 Not only do we offer the widest range of adjustment and twice the strength of any other kits available, We have yet again found a way to wrap all the very best components into one kit at a price that cannot be matched with the same 7075 Aircraft Aluminum and 4140 Chrome Moly Steel. UPR's New bump steer kit will eliminate all your bump steer headaches. ( We only use Stainless Steel for bump steer shims and not aluminum or stamped steel like other manufacturers ) The UPR PRODUCTS Pro-Series ™ bump steer kits were engineered to give you the quickest and best installation, without the hassle of drilling the spindle. Highly Recommended for all Vehicles equipped with Lowering springs, Caster camber plate kit, Offset rack bushings. 2006 2007 2008 2009 2010 Dodge Charger Challenger Magnum Chrysler 300 Hemi 5.7 6.1 SRT8. No one else can stack up to the bold clean styling of our aftermarket Billet dress ups, Street Strip & Racing Suspension & Performance Parts for your late model American Muscle Car!